Sometimes I get embarrassed of this blog and the things I write on here. I feel like I'm a little too dramatic and emotional, and I make too big a deal out of things that really aren't that big a deal. Like maybe I should skip all this blogging nonsense and write in a journal like a normal person instead of sharing my thoughts with strangers on the internet. But I also feel sometimes like honest feelings should be shared more, and often I write something I'm nervous about (this, for example) and realize that other people feel the same way. It's nice having people who can relate to what you're feeling. It makes me feel not so alone, even if I am being a tad dramatic. So here's something: today, I'm feeling sad. 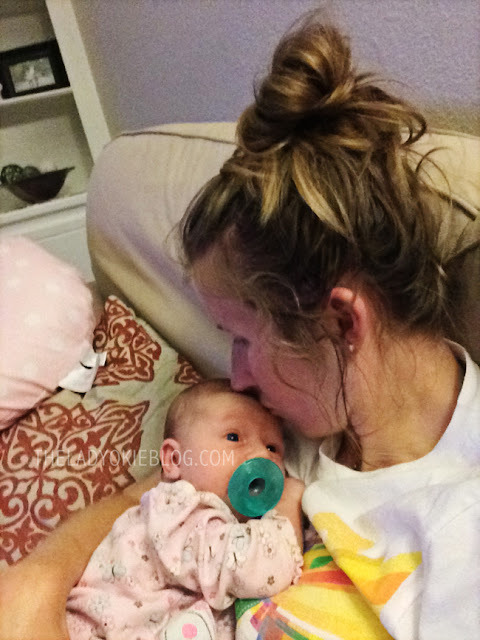 On Friday, I went in for my six-week postpartum checkup. I don't know what I was expecting, but I was a little caught off guard by how anticlimactic it was. My doctor came in, examined down there, took my blood pressure, weighed me, asked me if I had any questions, then proclaimed me healed. "You're good!" she said with a smile. "So... I'm good. Like, healed?" "So. I'm... done then. I'm good," I repeated like a moron. It was weird walking out of the doctor's office. For the last 9 months I've gone at minimum once a month, more like once a week near the end, and now I'm just... done. I wanted to ask her if we could meet for coffee or something next week. I might not have postpartum depression, but I think I have separation anxiety from my OB. I work about five blocks from the doctor's office (which was super handy for appointments), so after my checkup I brought R to the office to say hello to my coworkers. I also needed to pick up my laptop, because as of today I am back at work full time. I'm working from home for the next few months (PRAISE THE LORD), but still it's back to work for me. On the way home after leaving the office, I cried. The last year of my life has been trying to get pregnant, going to see an infertility doctor, getting pregnant, being pregnant, buying a house, having a baby, and then adjusting to this new life. And now, it's over. I'm healed and I'm back at work, and it's just all over. It's not that I'm not excited about having a baby and watching her grow. It's not that I don't love feeling more settled in our new house. It's not that I actually mind my job, because I'm lucky enough to sincerely enjoy what I do. I'm looking forward to seeing what happens this coming year with all of its changes. But for today, at least, I'm sad that this season that has been my life for the past year is over. And maybe that sounds dramatic and silly. Maybe tomorrow I'll wonder if I shouldn't have just skipped the post and written this in my journal. But maybe there's someone who can relate to mourning the loss of one season of life. It was a hard season, filled with anxiety and stress and lots of tears. But it was fun too, and it was exciting and new, and today I'm allowing myself to feel sad that it's over. I found this quote online from ND Wilson's book Death by Living that was sort of sad and encouraging all at once. I'll end with this because I can't think of anything else really to say but I feel like this post needs an ending. "The world never slows down so that we can better grasp the story, so that we can form study groups and drill each other on the recent past until we have total retention. We have exactly one second to carve a memory of that second, to sort and file and prioritize in some attempt at preservation. But then the next second has arrived, the next breeze to distract us, the next plane slicing through the sky, the next funny skip from the next funny toddler, the next squirrel fracas, and the next falling leaf. Our imaginations are busy enough capturing now that it is easy to lose just then. But some moments cut so deep they cannot be forgotten. They scar (for ill or good). They usually touch life itself, or some glimpse of what life could and should be. Or the opposite. Starting lines and finish lines; glory and grief in between." That being said, I get this, I totally do. I have felt the last several months feeling soooo incredibly sad at times. When I was pregnant and read/heard working mothers allude to the difficulty of balancing everything, I naively assumed they were referring to the actual logistics of maintaining a home, being a dedicated employee, and loving our wee ones. It is so much more than that- it is being emotionally frail and overwhelmed and feeling like we're lacking or not measuring up in one aspect of our life all.the.damn.time. Next month, I return to a normal 5 days/week schedule and I'm a freaking mess. I have no idea how to find that balance and feel like I'm giving Charlie and my job as much of myself as I can as it is! First off, YAY for working from home! I'm so glad you're able to do that. Also, I feel this so deeply. Not having an OB appointment on the calendar is still really weird. Every time I drive by her office/the hospital where G was born, I get a pang of sadness and almost want to schedule an appointment for the heck of it because I feel like I should still be going there every week. And even though I had been so excited to quit my job, I felt so sad once I actually did. But you've had so many major changes that it's got to feel so weird that everything is over. Oh sweet friend. It's OKAY to mourn passed seasons. You get to mourn. I think it's normal to feel that way when we go through big life changes!!! It's hard but I also know you'll find joy in this season too. I'm PRAYING for you as you start working again- you're superwoman! These are feelings that are shared by many, many moms and aren't talked about often so kudos to you for identifying and labeling whats going on. I felt the exact same way, and even though I'm a year out from my youngest baby (and my last) I will sometimes get transported back to those same feelings...that it is all over. Since I have an older daughter (five) I am able to not only have the foresight, but first hand knowledge, of all the good things that are on the way. The milestones that we have to hit, the structured happenings that I thrive in. I think it is important to honor whatever season we were previously in by looking back and recognizing the importance of it, the life changingness (I made up my own word) of it all. Also, yay for getting to work from home! First, I think we all have times when we wonder if we should just write down our feelings in a personal journal like a normal person. But I've never regretted sharing them and I hope you don't either! Real people have feelings and sharing them is what allows us to work through them and grow. Second, I don't think you're being dramatic. You're right - this is about more than just you going back to work, it's ending an era of your life and it's okay to mourn that. You've gone through some intense, significant changes over the last year and although they've put you in a wonderful place, it's reasonable to be sad that life has to go back to normal, but a new normal. As someone who has closed the chapter in my life of having more children, I get it. The only reason I have to go to my ob is for "fun" yearly checkups. Life is all about seasons, and as you mourn the loss of the old season, it's also fun to think about what the next will bring. Have a great first day back to work! I wrote a whole blog series about how I grieving my single life when I got married, and then Curby told me he was going through the grieving when we were expecting PJ... now both of us are going through it AGAIN with the birth of numero dos and how having 2 complicates things even more (even though really its just more complicated for now, eventually it will be easier). But I think you're feelings are totally normal (as you've seen from the posts above). I think part of it is that you are a new person now, before you were Amanda the woman (and daughter/sister etc), then you got married and you were Amanda the wife and woman, and now you are Amanda the mom, wife, and woman (etc) and that old Amanda has to go - this new one has different priorities, worries, joys - and its hard letting go of that person that we liked so much and we're hoping that this new person is someone we like just as much (or more!). My recommendation is to sit in the grief and discomfort, really think about it and say "goodbye" to that woman and "hello" to this one - it will help! I appreciate your honesty and all the emotions that you are facing as you start work back up again! God's not done with you yet and even though things might be different, there is still so much he has for you! PS glad you can work at home! Your honesty is refreshing. I imagine, but cannot yet know, that I will feel similarly. I will no longer be the pregnant woman receiving knowing looks, prayer in church, and subway seat offers. I will no longer have friends and family across the continent checking to see if I've gone into labor yet. I will have less about my body to monitor and measure, and will no longer feel movement inside of me. And so on. I think some part of me understands and empathizes with your mourning of a loss of sorts. I hope you discover ways in which to cope with it, and encounter much encouragement in this transition. In the last year you've gone from a married woman to a married, full-time working, home-owning mother. And I hope you have people in your world who can relate to your situation...all of those changes really narrow down the number of women who can. It sounds like you have a fantastic employer. I wonder if working from home (possibly part-time?) could be a permanent option for you. Good luck these next few weeks! Aw, I appreciate posts like this! You know, I wasn't sure that I could relate as I was reading and then I thought of how I felt when college was over and I got a little choked up. I think sometimes we just have those seasons that we want to stay a little longer in or we aren't wanting to be over yet. I get that. I'm glad you posted it here & not in a private journal. It's an emotion that I know you are not alone in feeling. I think having a child - you'll see there's so many stages you'll go through - all that will bring grief & celebration in each instance. Its OK... all of it is OK. I totally get this. You've been this one person (pregnant, just had a baby) for so long, and now you're a mom and should be "back to normal". But people heal (physically, emotionally) at different paces. It takes a while to get used to a new normal, and this new chapter in your life is exciting, scary, anxiety riddled, and awesome. But it's ok to be sad about the time you're leaving behind. Thanks for sharing this with us. I'm so glad that you post these heartfelt, honest posts. I am not good with words myself, so it's lovely to read and relate. Sigh. I know this feel all too well. I know marriage isn't as big of a change as having a baby, but my "season of engagement and marriage prep" was something I mourned heavily. It was strange because I was so happy to be married and definitely happy to have the wedding over with (the first thing we did after checking int our hotel that night was toast to no more wedding planning), but I mourned the loss of the exciting time and the anticipation. I love having things to look forward to. Just feel those feelings and let them pass through you. It'll make you stronger. It's okay to feel them. Also, start creating new milestones to look forward to: R's first Christmas, first birthday, first day of school, first date (haha, kidding). I don't think you should be afraid to share stuff like this. There are bound to be people out there feeling the same way with positive things to share with you. I think change is just hard, and you've had so many lately, so maybe doctor visits felt like a lifeline or at least one continuous thing, and I can see being upset about it even if it's not a logical thing to want to continue. Don't be afraid to feel what you feel! Validating your feelings is the best way to work through them. I have experienced this once before. For me it was only a small sadness that a season of life had ended. But I think I will really experience it when we have a kid someday. We are about to celebrate 11 years together... just us. I can't imagine how different life will be with kids. A good different. But different. You've faced so many HUGE changes in the past year. So many things that cause stress. It's only normal that there would be a lot of feelings (good and bad) as that season comes to a close. Also, I'm glad you share! Ahhh such major change! I don't blame you for being sad; I've felt similar emotions at different points of change in my life. Praying for you friend as you adjust! I'm over here wanting to just give you a hug! Even though I have never experienced what you have experienced, I can empathize with you and can imagine that this season would be a bit sad as you transition from that chapter in your life. You have a lot of folks out here who really, really like you. We smile and maybe get a teeny bit weepy at some of your posts. You are a good writer, and a good Mom. Thanks for being so open, sharing the real things of life. Also, I am so happy for you that you are able to work from home. Keep us posted! it is the future that we are most afraid of. We don't know what it holds, but we finally get a point when we feel "normal" where we were. Thank you for the beautiful reminder that it is ok to be sad and absolutely anxious when we get to a new hill to climb. That is so awesome you get to work from home. It will be a relief and a challenge I am sure but hopefully it helps you adjust. I think with any part of life there are ebbs and flows and when a new chapter begins there is always a sort of mourning period for it to be over, whether its a new job, a new home, a baby. It pushes you to change and sometimes it is ok to reflect and be sad of what that change means, even if it means a great new adventure. How did your first day at work go? I'm sorry you are sad but I am thankful that you have a place to write and share your feelings. It is hard to go through big changes and sometimes writing it out and hitting 'publish' is therapeutic. I feel like my life for the past few years has been packed with huge life changes and to be honest - I have no idea how to process it. The next thing comes so fast. I keep thinking (and sometimes telling Dave) that therapy will be coming my way one of these days. Hang in there though! God is faithful through each season and He will help you. I have a verse I read these week but I'm at a cafe and can't remember it right now but it was really good so I'll e-mail it to you soon. Came by via Gold & Bloom and I gotta say this post really resonated with me. I completely know what you mean - I was so sad when my midwife discharged me from her care. She's so lovely and had been in my life for the past two years. Also, I'm going back to work in two weeks time after my latest and last bout of maternity leave - it makes me feel sad that "it's" all over and now I'm going back to normality again. Of course I have two beautiful girls to look after and they (and hubby) are my whole world but still, going back to work just signifies the end of this special time. I hope your first day at work wasn't too bad for you. First, I had to let out a sigh of relief - reading your title, I thought you gonna quite blogging!! I'm very happy that you are not. Second, seeing a season of our life come to an end is never easy. I once read that the changing of the seasons in nature is difficult for human beings to adjust to, and we don't even live in nature any more and have to brave the cold and scarceness of food like our ancestors. But change is hard, and saying goodbye - be it to people, or life as we know it - is one of the most difficult things in life. The good thing is that new beginnings are exciting and full of promise. Working from your new beautiful home, being able to be around your adorable baby girl all day and being declared healed is wonderful! You've got this Amanda! I can relate, and I think that the reason why I keep coming back to your blog is because you are are so open and honest. You have this way of writing that makes me feel like I know you! But seriously, I can relate to this feeling. Before I got married, my husband was deployed, I was working in a busy but fun job, and I was getting my Masters degree. Then we got married, I finished my degree, and we moved away all at once. I was so happy that my husband was home and that we would finally be together, but I did kind of mourn the loss of that busy time in my life, even though it was stressful and challenging, even though I was missing my husband while he was deployed. It's a weird feeling. I think that allowing yourself to feel sad will help you transition to this new season of your life. Not acknowledging these feelings or thinking that you shouldn't have them isn't good for you. Here's to the future!